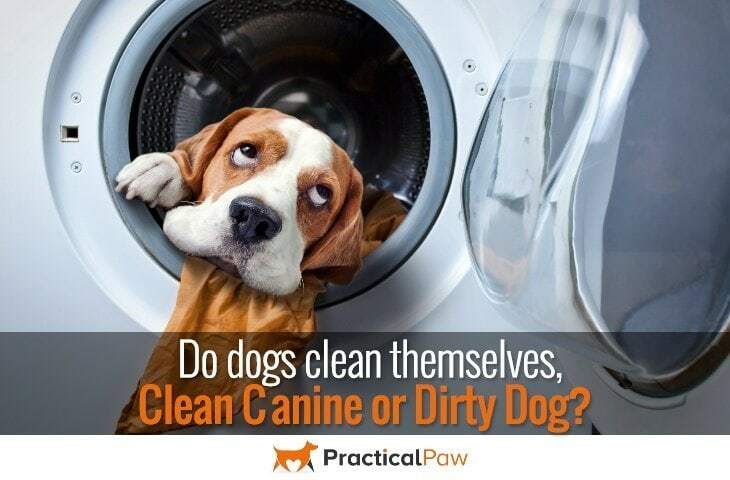 Do dogs clean themselves, clean canine or dirty dog? Do dogs clean themselves? The short answer is yes. Self-grooming is a natural part of our dog’s behaviour and keeps our dog’s fur and skin in good condition. They may not have the advantage of stepping under a shower any time they want to freshen up, but they have their own unique system of personal hygiene. How do dogs clean themselves? If you’ve spent any time with a dog, you will have noticed that they spend quite a lot of time grooming. Although they can’t clean themselves in the same way that we do, they have several ingenious ways to keep themselves spick and span. The most obvious way that dogs self-groom is through licking. Although they can’t compete with their feline counterparts, dogs do spend time passing their tongues over their fur to clean it. Of course, paws get the most attention when it comes to licking. But our dogs are also prone to cleaning other, more private parts of their bodies much to the embarrassment of their owners. 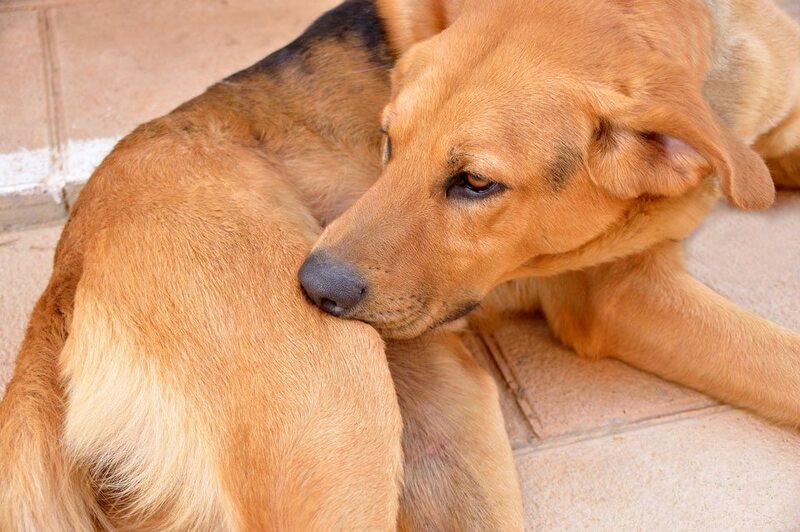 When our dogs lick, they also nibble at their fur. Our dogs use their small incisor teeth, to make small quick bites that act a bit like a comb to remove dirt and debris from their coat and skin. In addition, when our dogs nibble themselves, it stimulates the natural oil glands in their coats. The oil produced helps to keep the skin and fur clean as it travels down the hair shaft removing dirt and debris as it goes. A full body shake is an effective way of removing foreign objects from our dog’s fur. If you’ve ever witnessed your dog performing a body shake you may have noticed that it starts with their head and follows with a wave of twists all the way to the end of their tails. The full body shake produces a force that is between ten to seventy times that of gravity. And it’s the reason why your dog has to close their eyes while they do it. When wet, a full body shake can get rid of 70% of the water in a dog’s coat in just 4 seconds. Despite some dog’s desire to roll in smelly stuff, they also do it to aid in fur cleaning too. 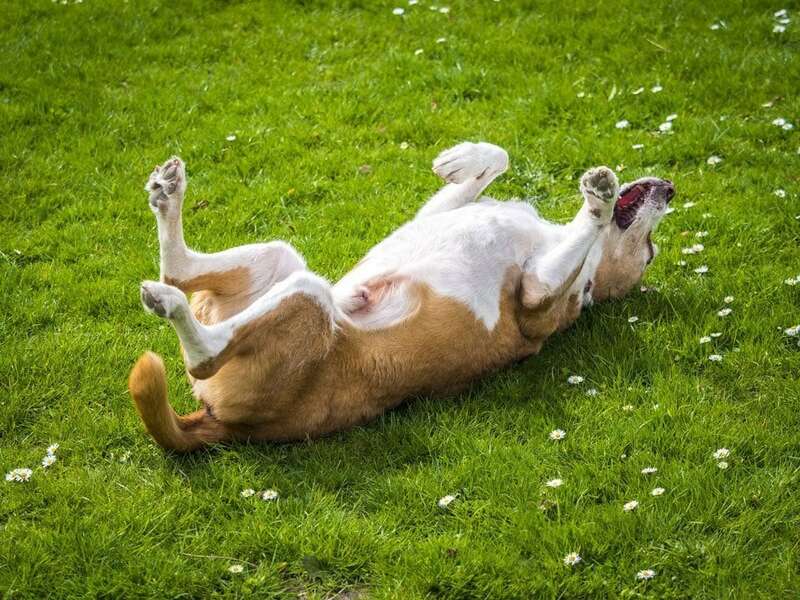 When dogs roll around in the grass, sand and dust, it allows them to get rid of excess fur and dislodge debris from their coats. And after eating, a dog’s quite likely to rub their face across the carpet and furniture to make sure that their face is beautiful and clean! Although all of the above behaviours are a natural part of our dog’s cleaning regime, licking can become problematic. Don’t ignore your dog if they lick excessively. As excessive licking can be an indicator of physical problems, such as pain and irritation or emotional issues like stress. Examine your dog thoroughly and check for any areas of discomfort, open wounds, ticks or regions that may seem painful for your dog. You know your dog so if their self-grooming behaviour changes and their licking increases there is usually something that they are trying to tell you. Most excessive licking falls into two groups; Physical reasons and emotional reasons. We’ve outlined some of the most common causes below. If you think that your dog’s self-grooming routine is extreme, then there are ways that you can manage and minimise the behaviour. Depending on the cause of your dog’s need to lick depends on the best way to help control it. However, the general rule is to use diversionary tactics. Shouting or scolding a dog will rarely work and if they are licking because of stress or fear you are likely to make the behaviour worse. If your dog is showing signs of extreme grooming, it’s important to look for the reason why. If you can’t find any physical reasons why your dog may be licking, it is possible that there is a psychological one instead. By far the easiest mental problem to overcome is boredom. Providing your dog with interactive toys or feeders, playing with them or taking them for additional walks will all help. Interactive feeders can also help dogs with anxiety and dogs with CCD. By working for their food, they are engaging in a healthier licking behaviour than chewing their feet. Yes, they do. Grooming is a natural part of dog behaviour, and our dogs have developed ingenious ways to keep themselves in good condition. Of course, they also benefit from a helping hand from us. Being part of your dog’s grooming ritual is an important part of sharing your life with a dog. However, if your dog shows signs of a change in cleaning behaviour, don’t ignore it. It can indicate a problem. If you are unsure of what may be causing excessive licking, do consult your Veterinarian who can investigate to see if there are any underlying problems.